Year(s) of the Boar--an Old boar for a New Year. February 5th marks this year's Chinese New Year. 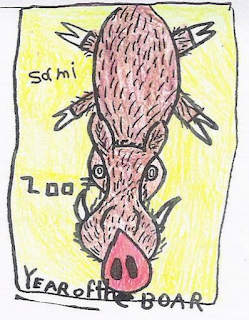 According to the Asian Zodiac, 2019 is the year of the Boar, the last Pig year being 12 years ago in 2007, and THIS year, I've decided to reproduce a drawing done 12 years ago by my younger son, S.
It's a story that many know already. 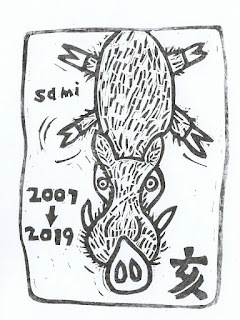 In 2007, I had just started making woodblock prints and I had intended to join that year's Baren Forum Zodiac Exchange (the sign-up closed before I could join so my print wasn't included). As is my usual working method, I made thumbnail sketches, redrew and redrew while looking at multiple images from the internet. The prep stages took a couple of weeks before I decided on an image that was then carved and printed for the Year of the Boar, 2007. But S wasn't really interested in signing a family card and said he would make one of his own. So he disappeared for about 25 minutes and came back with the image you see above. We were thrilled with his drawing and photocopied it to include inside the envelope with my card. But he was clearly unhappy and he became more and more disturbed until he finally burst into tears, distraught and inconsolable over the idea that he couldn't draw as well as I did. I made it worse by laughing at the obvious--and I tried to convince him what I knew to be the truth, that his drawing was original, and funny, and wonderfully creative and perfect and much, much, much better than mine. (He didn't believe me). I promised then that the next year (Year of the Rat) he would design the family card (and he did). Now it's 2019 and S. is now 18. He doesn't draw as much as I'd like, and he's into Manga, so much of what he does draw looks a little too much like rather anonymous Japanese or Korean manga. But he's also learning Japanese and hopes to visit Japan next year after he finishes high school. 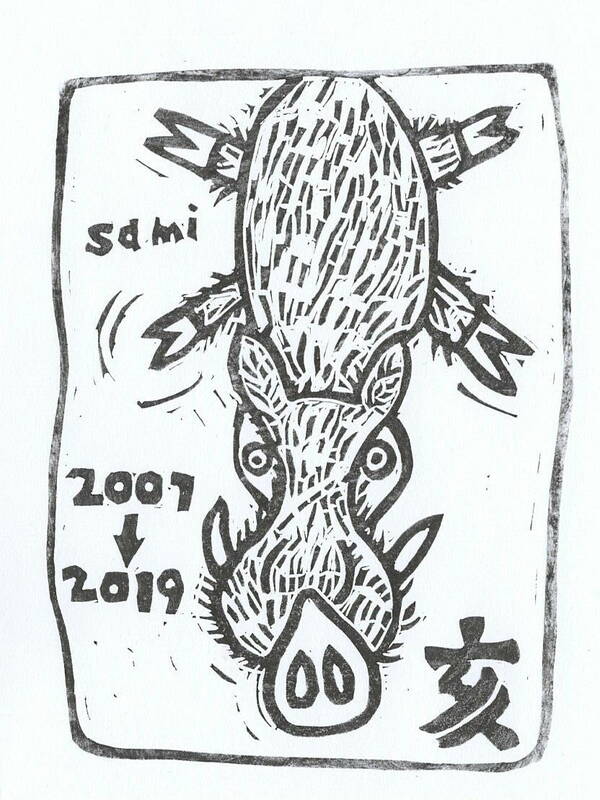 And 12 years later I still think his boar is fantastic and he accepted my proposal to use it for this year's greeting card. He made a couple of adjustments, adding the Kanji symbol for "Boar" and the "new" year-- 2019. And I removed the text at the bottom to make it easier to print and carve. The new key block, from tracing the old and carving it from a linoleum block. Two of the color blocks printed. I tried to keep it as close as possible to the original sketch. There is a linoleum key block and 3 additional wood blocks for the color plates. 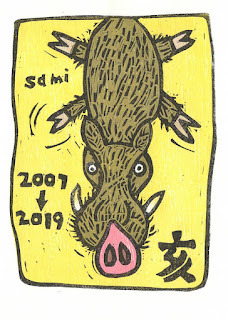 (Yellow(background), Brown (Boar body/head), and a mixed block to print the pink snout, the tan trotters and the bokashi-stained tusks of our spirited boar. 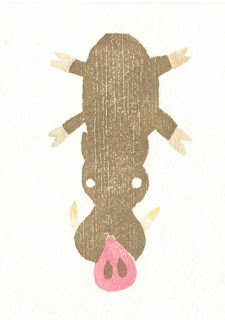 All were printed with watercolors, sumi ink, and rice paste using a baren.